There are only a few days remaining until the final season of Game of Thrones begins. It's been almost two years since we had new episodes and it's boom times for wild theories about how the show will end. People are digging hard into Cleganebowl, Gendry's importance, who might be Azor Ahai, and maybe even trying to tie Dunk the Lunk to the Mother of Dragons. But while speculation gets wilder than the Brotherhood Without Banners, series creators David Benioff and D.B. Weiss are legitimately dropping hints about what to expect from the show's finale. The pair created a playlist called "Game of Thrones: The End Is Coming" on Spotify this week. "The answer to the end is one hundred percent hidden in the playlist choices," they told Spotify's blog. "No one will believe us, but it's true." Music has always had a place in the show, including cameos from bands like Mastodon, Of Monsters & Men, and Ed Sheeran, as well as songs by The Hold Steady and Sigur Rós, among others. So, the creators have always worn a love of music on their sleeve to some extent. "We were looking for songs that made us feel the way the show made us feel," the duo said. "There’s variety in there—Rage is not Johnny Cash. But they both have a deep inherent power." Power unequivocally plays a role in the show and is literally in the playlist with "Power" by Kanye West and "Powa" by Tune-Yards making an appearance. This new playlist -- they also created one sans easter eggs in 2017 -- features tracks from Danzig, Rage Against the Machine, Pixies, TV on the Radio, and many others. The 50-song track list isn't easy to read if you're trying to read the tea leaves. "Sleep Now in the Fire" followed by "Her Dark Wings"? 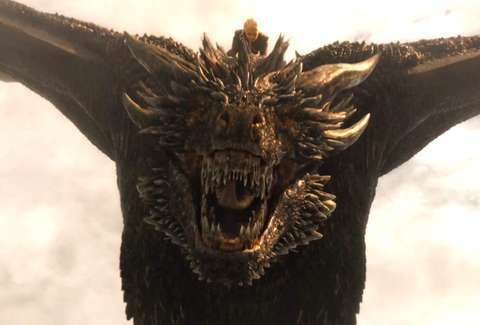 Will Viserion battle Drogon? "Sleep in the Deep Blue Sea"? Is the Golden Company not making it to Westeros? Might "Crown on the Ground" be bad news for Cersei? Or are we supposed to string titles together? "Wolves of Winter" followed by "Go to War"... it all makes sense now. Maybe. Or something. Dustin Nelson is a Senior Staff Writer on the news team at Thrillist. Follow him @dlukenelson.